The TCA cycle (tricarboxylic acid cycle) is also called the citric acid cycle or, sometimes, the Krebs cycle. It takes up where glycolsis left off, improving the efficiency of respiration by extracting a little more energy to produce some more ATP. We should start by looking at a map of the cycle. When we left off, glycolysis had reached its conclusion with the formation of pyruvate, a three-carbon compound. The pyruvate is converted into acetyl coenzyme A, an important metabolite involved in many processes. The acetyl coenzyme A is taken up into the citric acid cycle; you can think of it as the link between glycolysis and the TCA cycle. The cycle itself is shown below. 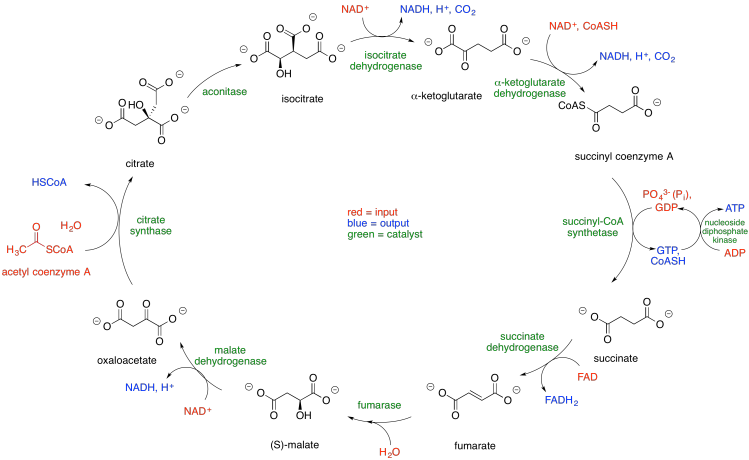 In this map, compounds coming into the cycle are shown in red, compounds being produced are shown in blue, and the enzymes responsible for carrying out the various steps are shown in green. You can see that citric acid, or citrate anion, is the first-formed product once acetyl coenzyme A enters into the cycle. We can think of the oxaloacetate as a carrier that picks up the acetyl group from the acetylcoenzyme A, does some work, and is eventually regenerated. In reality, things are slightly more complicated, however. It may be helpful to look at the TCA cycle in a slightly different way. We can take the same map and alter it so that it highlights the changes in the molecule at each stage of the cycle. In this map, each step is colour-coded so that you can follow where things are going during that step. 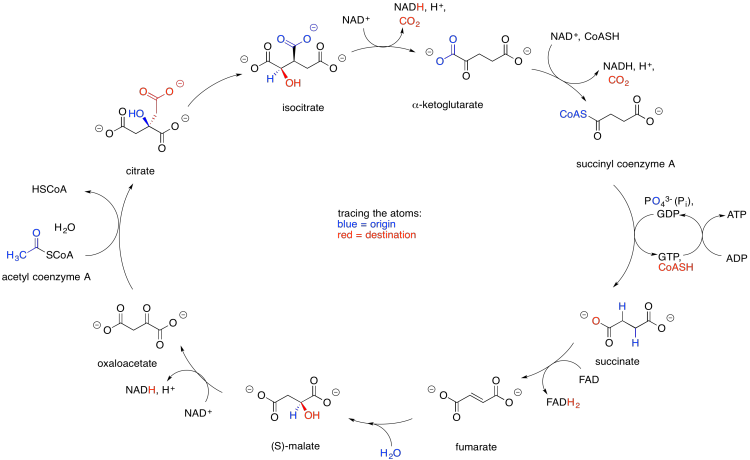 For example, the acetyl coenzyme A is labelled in blue as it comes into the cycle; its destination within the citrate molecule is shown in red. In the second step, there is a hydroxyl group that shifts from one position to another. We can see where it starts out in blue and where it ends up in red. Looking at the cycle in this way can help us to keep track of the changes at each stage of the cycle. That can be helpful as we try to analyse how each step occurs. It can also be useful to label each carbon atom in those two beginning molecules, acetyl coenzyme A and oxaloacetate. When we do that, we get a sense of some overall changes occurring along the cycle. Specifically, there are a couple of molecules of carbon dioxide evolved along the way. The oxaloacetate picks up an acetyl group, growing from a four-carbon compound to a six-carbon compound. It later loses first one carbon and then a second, eventually becoming oxaloacetate again. Where do these carbons come from? If you follow the cycle carefully, you will see that they actually come from two of the carbons in the original oxaloacetate molecule: one carbon from each end of the chain. Although the TCA cycle at first appears to involve the conversion of the acetyl group to two molecules of carbon dioxide -- an idea that seems consistent with the oxidation of glucose to carbon dioxide in respiration -- there is something more subtle happening here. The acetyl group is eventually becoming oxidised to carbon dioxide, but first it must be incorporated into the oxaloacetate molecule and sent through the TCA cycle a couple of times. In the subsequent sections, we will take a closer look at the relationships between the compounds in the cycle before examining the mechanisms of the enzyme-catalysed reactions. If the conversion of oxaloacetate to citrate is Step 1 of the TCA cycle, which steps result in the loss of carbon dioxide? Glycolysis and the TCA cycle are important metabolic processes central to the use of energy by the cell. If the conversion of oxaloacetate to citrate is Step 1 of the TCA cycle, which step is involved in ATP production? In addition to being useful cofactors for a number of processes, NADH and FADH2 are employed in another metabolic process, oxidative phosphorylation, to make additional ATP. If the conversion of oxaloacetate to citrate is Step 1 of the TCA cycle, which steps are involved in NADH and FADH2 production?